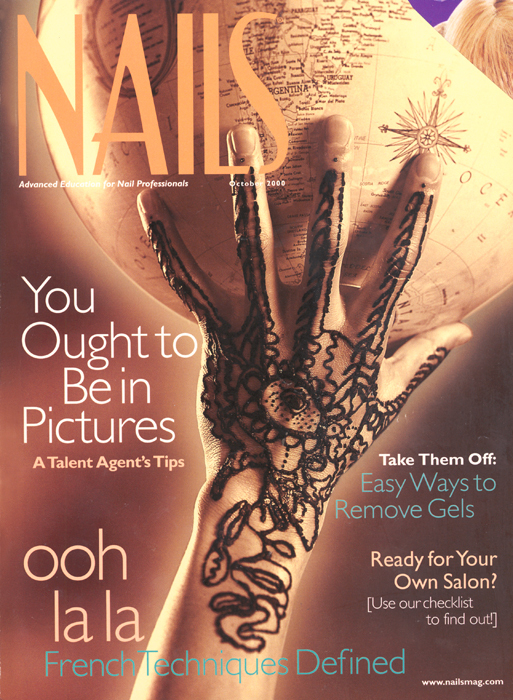 Nails: Maisie Dunbar, owner of M&M Nails and Wellness Center in Silver Spring, Md., gave this month’s cover model a natural nail manicure followed with a henna design. Milagros Hernandez devised an ingenious solution for clients with ski-jump nails. Here, we give you some tips on removing gels. From filling to soaking there’s more than one way to do it. And it doesn’t always have to be difficult. Manufacturing electric file bits with tungsten carbide creates long-lasting and extra-durable bits. “It’s a great compliment when folks walk in the door and say. ‘The place smells wonderful,’"
French manicures are the belle du jour for fall. With these variations, your clients’ nails will look trés chic. Mario Tricoci has done it again, and this time he has spared no expense in the nail department. Maisie Dunbar, owner of M&M Nails and Wellness Center in Silver Spring, Md., came up with the idea of doing a tribal henna design on the hand for our “global outlook” cover concept. Follow the steps outlined by agent Crystal Wright and you may join out industry’s most elite group by becoming one of the tech who makes celebrities and models look perfect before they step in front of the camera. Other salons are great places to get clues about what you’re doing wrong and a better idea of what you’re doing right. Feng shui is an ancient Chinese art designed to balance the energy flow in our living and working environments. Readers suggestions range from simple birthday cards to special offers on their services. Nail techs aren’t the only ones who can benefit from sticking to a code of conduct. 85% of day spa-goers are female and almost half are college grads. Readers respond: How do you acknowledge a client's birthday? Do you have what it takes to open your own salon? Or are you at a loss as to where you should even begin? What you need are the general principles and practices of salon ownership and a checklist to evaluate your. With all of the media available today, resources abound when it comes to opening your own salon. Is multi-level pricing a solution for keeping the best nail technicians satisfied and motivated in their jobs? Some salons say yes, indeed. L.A. Meets "the Nail King"
If you were to call Top 25 competitor Amy Anzlovar a witch, she wouldn’t take offense. By developing a good working relationship with podiatrists they have faith in, nail techs can protect themselves when and if a problem occurs. As I See It: The Great National Wash-Up! I’m suggesting that as an informal movement to prepare ourselves for whatever new or old clients come through our doors, we designate October National Wash Your Hands Month!